The Sustainable Development Goals (SDGs) are an important advocacy tool. In 2015, 193 countries signed up to the commitments contained in the 2030 Sustainable Development Agenda including the 17 SDGs and related targets. These can be used to hold Governments to account, monitor progress and to link your existing advocacy efforts to targets contained in this global framework. The SDGs have enormous potential for transformative impact on the root causes of gender inequality but to achieve this we need governments to meet their existing global commitments to progressing women’s rights and gender equality. This page provides information on the SDGs, how to use them for advocacy and the associated reporting processes and regional and international fora. This section will be updated with links to webinars and notes from any Working Group discussions. Find information about the HLPF 2018 here including the program and background notes. 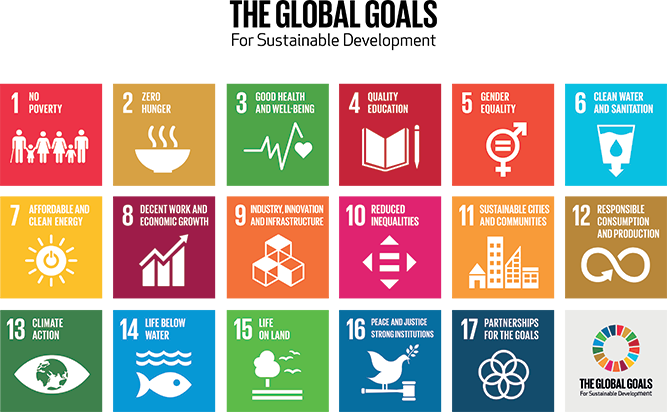 The SDGs, or Global Goals for Sustainable Development, are a set of 17 goals and 169 targets, which have been agreed on by 193 countries. They provide us with a universal pathway to drive systemic change in our countries, in our region and in the world. This website contains information on each SDG and links to further information. The 2030 Agenda for Sustainable Development, including the UN declaration, information on each goal, and information on key processes and implementation plans. Explains the links between the SDGs and human rights. Gender Equality and women’s empowerment has been acknowledged as central to the achievement of the SDGs. 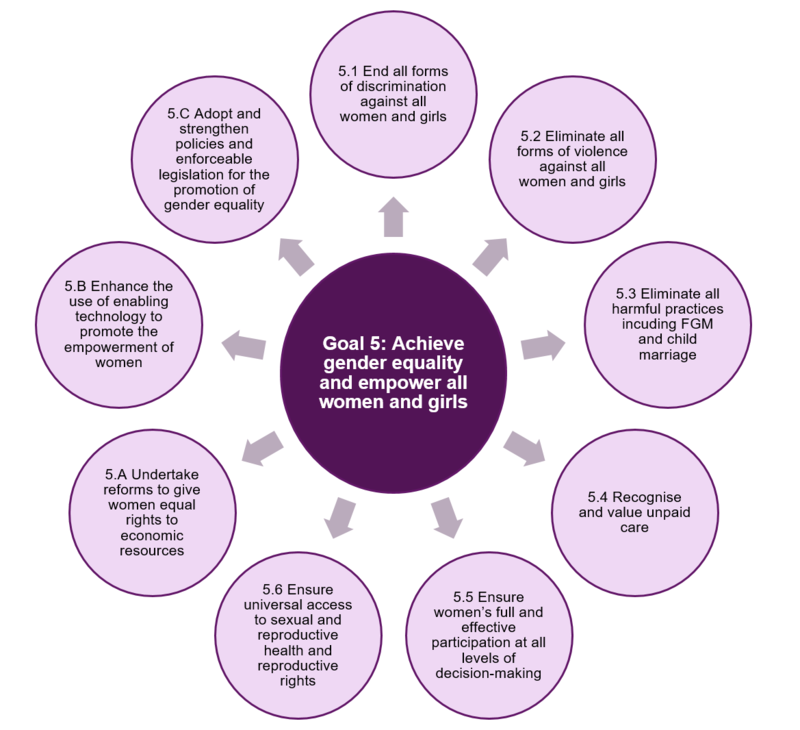 Gender equality is recognised within the SDGs in a standalone goal, Goal 5, as well as across other goals through a number of gender-related targets and indicators (see diagram below). Provides an overview of SDG 5, including all targets and their indicators, as well as links to further information. UN Women report that provides an overview of gender equality across the 2030 Agenda. This includes the follow-up and review processes, the indicators framework and other useful information towards gender equality and the SDGs. A summary is also available. Identifies a series of macro-level tools to create a supportive environment and resources to promote SDGs related to gender equality. An overview from the United Nations as to why gender equality and SDG 5 matter. This report aims to encourage more women and men to pursue a leadership approach aligned with the SDGs and shows that women in leadership roles have a unique part to play in achieving the goals. This is a handy guide to the links between CEDAW and the SDGs. The SDGs are driven by a number of key international and regional processes. Understanding these processes and their role in advancing the SDGs can inform your advocacy work and provide opportunities for engagement. The High Level political Forum (HLPF) is the United Nations main platform for sustainable development, and is central to the follow-up and review of the SDGs. It adopts negotiated declarations, reviews commitment and the progress of the 2030 Agenda for Sustainable Development. It meets in July; both under the General Assembly every four years and the ECOSOC in other years with technical, ministerial and high level segments. At each HLPF, focus is given to a particular theme and a number of SDGs. The HLPF in 2018 is focused on ‘Transformation towards sustainable and resilient societies’, with goals 6, 7, 11, 12 and 15, as well as goal 17 given particular attention in review. Major Groups, representing key sectors of society, help channel the engagement of civil society in United Nations intergovernmental processes related to sustainable development. The NGO Major Group facilitates the participation and engagement of NGOs in the processes directly and indirectly related to the HLPF. The Women’s Major Group (WMG) facilitates women’s civil society input into the policy space provided by the United Nations, including input regarding the SDGs. The WMG produces position papers, presents at sessions of the HLPF and coordinates advocacy through social media, briefings and events. In 2016 United Nations Economic and Social Commission for Asia and the Pacific (ESCAP) member States agreed that the annual Asia-Pacific Forum on Sustainable Development (APFSD) will serve as a platform for supporting follow-up and review of progress on the 2030 Agenda and the Sustainable Development Goals at the regional level. Voluntary National Reviews (VNRs) report are produced by Governments on country progress, successes and challenges in implementation of the SDGs. Countries are recommended to present at least two national reviews at the HLPF by 2030. However, the timing for reviews will be determined by Members States. VNRs are an important mechanisms through which policies and government institutions can be informed and held to account on SDGs implementation. This guide [PDF] produced by the WMG aims to provide guidance for women’s rights organisations to develop VNRs with governments or in preparing alternative reports to ensure gender-responsive implementation of the 2030 Agenda for Sustainable Development. As governments work towards achieving the SDGs and the 2030 Agenda, advocacy can be a powerful way of engaging with departments and ministers to demand resources and commitments, and form partnerships to work more effectively towards achieving the goals. Below you can find resources such as information, checklists, toolkits and examples of how advocacy around the SDGs and action towards the goals can be used to transform society. Progress Report on the Road [PDF] map assesses progress against the regional road map by 2018. Provides examples of transformative action and progress towards the SDGs in the Asia Pacific region. An assessment of the progress towards the SDG targets in Asia and the Pacific and its subregions. This report addresses regional progress on SDG implementation, progress at the subregional level, and disparities in progress towards the goal and target areas. This advocacy checklist aims to help you think about how you can use the SDGs (and, in particular, Goal 5 on gender equality and women’s empowerment) as a way of engaging with departments and ministers, demanding resources and commitments from your Governments, and collaborating with others to achieve the greatest impact. This guide provides advice on how to advocate to ensure commitments to women’s rights and gender equality in the Sustainable Development Goals are fully implemented, resourced and monitored at national and local level. It is aimed at women’s rights organisations and those working on women’s rights and gender equality in other civil society organisations. Platform that provides practical direction in assessing, planning, implementing and monitoring local policies in relation to the SDGs, and provides tools to support stakeholders towards effective implementation of the SDGs. Global registry of voluntary commitments and multi-stakeholder partnerships.